That's right - my Dad can crochet! And he does it very well, too. He's been doing it for the last 10+ years. My Aunt showed him how and then he taught himself. 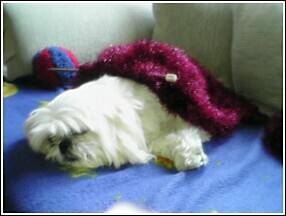 He likes to do it during the cold winter while watching TV. I have been the happy recipient of many fine crocheted items over the years! I have dishcloths, potholders, place mats, afghans and doilies. 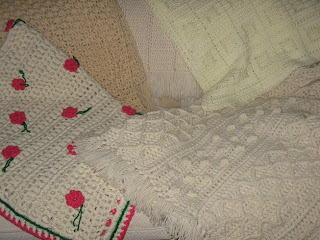 Here is a pic of some of the afghans my Dad has made (my Step mom helped on some of them). 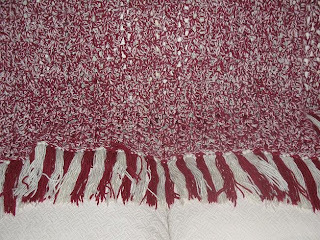 Obviously, I have a thing for neutral afghans. I have more - these were the most easily accessible. Aren't they wonderful? I like them so much, I had Dad show me how to crochet a few years ago. Here are all the afghans I have completed. Dad crochets doilies, too - crazy! I can't handle the thought of working with those tiny threads. 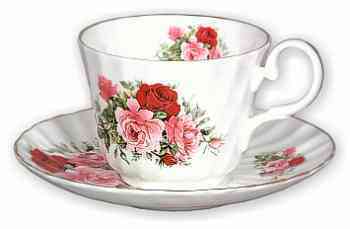 But they are all lovely and I have picked out a few to keep. 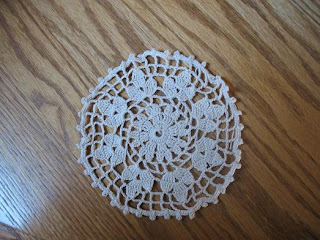 I even have this lovely heirloom made from Dad's doilies - so special! And here's the best part! Just for you, my Dad is letting me give away 2 of his doilies. He finds it amusing that anything that he makes would be considered a prize in a giveaway and thinks that not too many people would be interested in winning a doily. I beg to differ, Dad! These are beautiful handmade doilies that could be displayed or given as gifts. This doily is 15-16 inches across and is an ecru color if you can't tell. 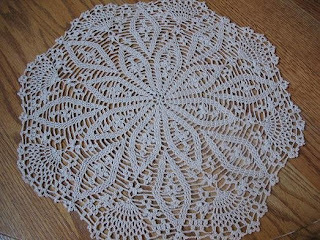 This little doily is about 6 inches across and is also ecru. One very blessed winner will get both of them! To enter, comment on this post. Easy! Want an extra entry? Promote my blog by posting about it or linking to it on your blog - you could talk about this giveaway, or Thanksgiving recipes that are linked up to the turkey button on my sidebar, or my chocolate Fridays - info linked to the chocolate button on the side, or just link me up in your blogroll, etc. Come back here and leave a separate comment if you do any of those things. And I'll even give you one more chance for an extra entry! 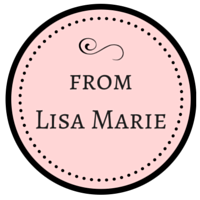 Leave me a comment giving me some specific feedback on my blog and telling me your 2-3 favorite posts. So, 3 entries per person are possible. Have fun! I'll keep this giveaway open through the weekend and will draw a random winner on Sunday night, 11/23. I'll e-mail the winner and post the result on Monday the 24th. I think this post is long enough now! I hope you have a wonderful, blessed Monday! How wonderful. Your Dad is Mr. Talented. I would LOVE to win those. I use doilies but don't have anything that nice. As far as my favorite posts, I would have to say that I love ALL of your Tea for Tuesday posts. They are just fun to read and put me on a search for different teas I hadn't heard of. Your pumpkin week posts where great as well. Should I get brownie points for being your first follwer? LOL! Your dad is talented! I would definitely love to win a doily. It is beautiful! I learned to crochet once. But, now I need to relearn. I keep meaning to but there have been other distractions. KWIM??? Oh Lisa, I was just thinking how much I would love to have a doily! And there you have not one but two available to a loving home. And it makes it even more special coming from your father! Do you know that I do not have one single doily - that's right, so you know I'm hoping to win these! By the way, at least you completed an afgan - I have started so many and I never finish! Pathetic! I guess your dad is like many of us; he doesn't believe in the value of his own work! Psshh...Those are beautiful items he has created with his own hands. 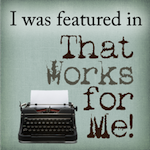 I want to win, so I'll also give a shout out on my blog. Those doilies are gorgeous! My hubby knits but doesnt crochet.. i might have to change that lol. Oh how wrong your father is... 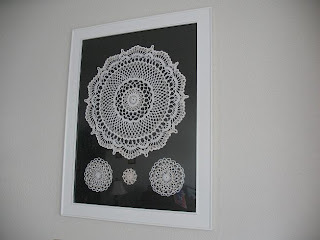 I have similar doilies from my grandmother (or great - ?) matted on velvet and framed, hanging in my hallway. So very lovely, and definitely a treasure! Oh, I love doillies!!!!!!!!!!!!!!! Please count me in. I will be posting about it on my blog so I will comment again once it is up. Gosh, your Dad's work is beautiful! Please tell him that anyone who received any of his work would be honored! Awesome crochet work! My Grandpa learned how to crochet when he was in a TB sanitarium as a teenager. I have two of his pieces and one, a pineapple doily, we used on the communion table for our wedding, since he died just prior to that. It was nice to have a piece of him. The art of your father is such a beautiful blessing! Wow, your dad is really talented. I'd love to win the beautiful doilies. Wow, your Dad's work is beautiful! The doillies are great. He is indeed very talented. I'm so jealous of your guys' great crocheting. All I can do is a straight line! Well, this is my second try, but I don't think it will be the same. I really love your blogs about your boy and his dog. I also like the one that you wrote about your mom. I enjoy all the Tea-for-Tuesday and am constantly thinking about you when I have my tea or see tea things at the thrift store. 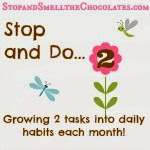 This may be cheating, but I have to say just reading your blog each day is so fun, and I might add, give me time to actually "stop and smell the chocolate". On occasion I even get to taste the chocolate. :) Please, keep the personal stories and little ditties (poems) for I look forward to them. They are lovely! Thanks for the giveaway. beautiful! he has talent!! thank you. Goodness--I wish my dad had crocheted when he was alive--it may have stopped him from drinking too much! I think knitting and crocheting have a calming effect on us. SO thanks for posting your dad's wonderful things. I love any post about food and recipes, too. I guess I'm as addicted to food as my dad was to "one more beer!" And I got her from Grace at Lovin Comfort---seems she always steers me straight! now, THAT is a good man! a man who can crochet! wow! very impressive! I would love to win the beautiful doilies! Thanks for giving us the chance to win such a family treasure! How special that you dad does this! Not everyone can say that have hand made goodness form their dad! I love them , he does nice work!